The Lotsawa Rinchen Zangpo Translator Program (LRZTP) is a specialized two-year and two-month Tibetan language program which provides students with a broad knowledge of colloquial and literary Tibetan, as well as dharma terminology and interpreter training. The LRZTP 8 program will differ a little from previous LRZTP programs. It will be divided into two components. The first will last two years and focus on Tibetan language with special attention to Dharma terminology. The second component is intended for those individuals who wish to pursue a career in Tibetan interpretation. It will last two months and will focus on interpreter training. Together with FPMT, Lotsawa will assist the FPMT affiliated graduates of the interpreters program to find a center to start their two year apprenticeship. The two-year program will be using pedagogical method of “Student Based Learning”. In this method there is an emphasis on the active role of the student in the process of study. The learning process is divided into five aspects which will be implemented and evaluated. the five aspects are: Foundational Knowledge & Application, Integration, Human Dimension, Caring, Learning How To Learn. There will be the opportunity for external language students to join LRZTP 8 for the second year (provided there is space) and/or the two month intensive program, provided they pass the LRZTP entrance exam prior. Attention please: Thanks to Khyentse Foundation and their Ashoka Grant, we are now offering a discount for LRZTP8 students from India. The condition is they must be Indian citizens. The percentage of fee discount will depend on how many Indian students apply. What will LRZTP 8 include? 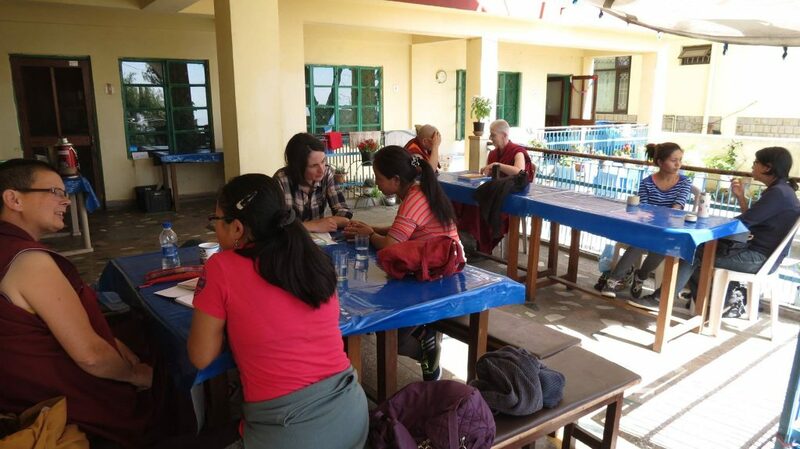 The program will include daily classes in the morning with the teachers, one-on-one afternoon classes for colloquial training with native Tibetan language tutors and daily listening comprehension exercises. Throughout the two years, specialized classes will be offered by visiting teachers. These classes may take the form of Dharma talks, Q & A sessions and interactive workshops. The two year program will be divided into ten modules, five per year. This training program will be divided into two modules. Specific dates will be confirmed soon. Program fees are inclusive of administration costs, teacher support, language tutor support, lunch and one-on-one conversation classes. They do not include housing, visa costs or LTWA fees. The registration fee is non-refundable if the student is no longer willing or able to join. An exception will be made if the program itself is canceled (highly unlikely). Sent the following to lrztp.manager@gmail.com- two passport sized photos, passport photocopy and two recommendation letters from Dharma related people. Signed the LRZTP student agreement. Paid the deposit of 400 USD. This deposit is non-refundable should the applicant decide to cancel. There are only 20 places in LRZTP 8. A wait list will be created if there are more than 20 applicants. Have a valid student visa permitting study in the Dharamsala area (for non-Indian students). Please note that LRZTP does not offer student visas. Please contact lrztp.manager@gmail.com for visa related questions. All students will have a computer or tablet that will allow them to read and write in Tibetan, use the Anki software and be familiar with Google Drive. Commit to the FPMT ethical agreement between the school and the students. Fill in the medical form and include two up-to-date next of kin in case of life threatening emergencies. Have a level of active as well as passive English which permits them to follow classes, perform tasks, write essays and successfully engage in study-related research in English. First year teachers: Geshe Tenzin Wangdak, Filip Majkowski, and Alex García. Second year teachers:Geshe Tenzin Wangdak, Filip Majkowski, and Alex García. Two hour language class with our experienced Tibetan co-teachers, most of which will focus on Tibetan dharma terminology. Daily classes of two hours will support the student’s development in spoken Tibetan. Students will work one-on-one with native Tibetan speakers (language tutors) using material from the main teaching class. All language tutors undergo specialized training before the commencement of LRZTP 8. In addition, they receive refresher workshops during the program itself. Listening comprehension will support the LRZTP student in understanding and making sense of the spoken language. They will learn to recognize speech sounds, understand the meaning of individual words and the syntax of sentences in which they are presented as well as enhance memory and retention skills. The exercises will be delivered through an online platform and include audio material by native Tibetan speakers. The audio material will be in accordance with module topics. The students will engage with these during their personal study time, outside of class hours. Exams and assignments are another method of support we provide for our students. The objective of LRZTP assessment is to allow the students to realistically gauge their language abilities. Saying this, students must display that they have attained the learning objectives for each module to a accomplished level. At the conclusion of each module, students are tested on their listening and speaking skills within the context of the specific module topic. There will also be weekly formative evaluation activities designed to support the student’s progress throughout each module. Students are required to successfully undertake both final year and interpreter training exams in order to be accepted for an apprenticeship in a dharma center after LRZTP 8. LRZTP 8 students will only be accepted if they are on a valid student visa which permits them to study in Dharamsala for the length of the course, or if they are local students. As for now, LRZTP is not a recognized educational institute and as such, cannot accept student visa applications. In the past, the students of LRZTP actively participated in one morning class at the Library of Tibetan Works and Archives (LTWA). The LTWA is a recognized educational institute for student visa application. You are welcome to contact LRZTP for information about the application of your student visa at lrztp.manager@gmail.com. It’s important to note that the availability of FPMT Center apprenticeships vary from year to year. Those students who wish to work at a FPMT center will attend the LRZTP program as FPMT affiliated students. Please note that LRZTP will only certify students as interpreter trainees if they complete the interpreter training program. There are two ways of participating in LRZTP interpreter training – either as an FPMT affiliated student or as a freelance student. FPMT affiliated students must commit to work in an FPMT center for two years after successfully graduating from both the two year language program and the interpreter program. Freelance students do not have this obligation. Program fees are subsidized for FPMT affiliated students.